Banding Together for Communication Studies Day! 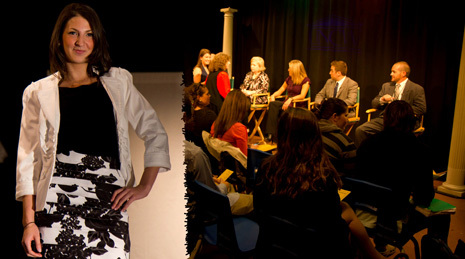 This week UNCW is bringing out the big guns with the 2012 Communication Studies Day. On Friday March 30th the entire Communication Studies department is banding together in Leutze Hall to put on a day full of learning and networking opportunities. Communication Studies day encourages students to show off their work and network with communication professionals through question and answer panels, an educational fashion show and multiple networking sessions. In essence, Communication Studies Day is what Integrated Marketing Communication is all about. The entire department and related student groups have all had a hand in the event this year. The COM Studies Society is hosting the 10th annual Dress For Success fashion show and in coordination with the studio production classes have created a special video to run during the event. The Communication Studies Honors Society is running a raffle and our IMC class will be live tweeting and blogging throughout the day. The event is effectively bringing advertising, public relations, event planning, direct marketing, word of mouth marketing and social media together in a holistic fashion. When strung together all of these aspects are what make COM Studies Day an incredible IMC experience. Want to join in on the fun? Hashtag #COMStudiesDay with your tweets so we can get it trending! What’s Your Unique Brand Style?